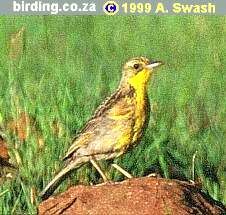 On 7 July, Faansie Peacock and Etienne Marais confirmed the presence of at least 3 Yellow-breasted Pipits in the new section of Suikerbosrand. Martin Benadie had reported 2 birds on 30 June, co-incidentally very close to where Etienne Marais had seen a bird on 14 June, while birding with Ken Freeman of Australia. Yellow-breasted Pipit is listed in the Red Data Book as "Vulnerable" with an estimated population of 2500-6500 birds worldwide, all of which are found along the high grasslands adjacent to the eastern escarpement, between Mpumalanga and the Eastern Cape. The nearest to Gauteng that it is known to occur is around Dullstroom or Memel, in the eastern Free-state. The winter movements of this species are rather poorly known, although some birds are known to move to lower altitudes in winter, presumably to escape the harshest weather. The occurrence of at least 3 birds in the Suikerbosrand Nature Reserve for a period of over three weeks suggests that this is an area used by these birds for overwintering. As far as we are aware, these are the first records of this species for Gauteng, but given their non-descript plumage and the "ordinary highveld" habitat the birds are in, they may have been overlooked in the past. As the photo of one of the Suikerbosrand birds (below) indicates, they are not easy to identify! In order to be sure you are a looking at a Yellow-breasted Pipit, you will need to get a really good look at the birds, preferably with a scope. The birds were mostly silent, only one short (diagnostic) call being heard in about an hour of watching. No recordings were played. The "new" section of Suikerbosrand consists of 11 000 ha of land which is mostly reclaimed farmland. One section is currently accessibly (July 2004) via the Eendracht road, which is currently being used by some through traffic, and for which there is thus no access control (although this situation will change in future). The "Eendracht road" is on the left, 3 km from the N3 highway, along the road to Suikerbosrand. Once through the gate, proceed over a bridge (stream-bed) and some 100m further on there is a small rocky outcrop. The birds were at the end of the firebreak on the left hand side of the dirt road. The birds were seen amongst and just beyond these rocks, and at the edge of the longer unburnt grass at the end of the firebreak. 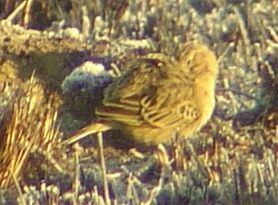 Conditions were cold and frosty, and Yellow-breasted Pipit normally avoids burnt areas and short grass. They may have been foraging in more open areas, because of the frost and damp grass. Heavily scalloped upperparts (blackish), underparts buffy (fading paler towards centre). Small yellow patch in centre of belly (only visible from certain angles). Note that this patch is hard to see, but when seen at the right angle is quite distinct - bright yellow. A yellow feather on the underside of the "shoulder" (alula feather) and yellow underwing. The face rather plain looking, with a smudge visible under and behind the eye (incomplete malar stripe) on the one bird, and narrow stripe from base of bill to base of ear coverts on other bird. It seems that African Pipit has two stripes below the eye, Yellow-breasted only one, which is variable in non-breeding plumage, which is much higher (closer to eye and ear coverts) than the lower malar stripe typically present on African Pipit. Top of head is distinctly streaked blackish. Streaking on the breast very slight. The tail appears shorter than in breeding plumage - perhaps a function of the moulting process? Cape Longclaw, African Pipit, Quail Finch, Red-capped Lark, Spike-heeled Lark (H). At least 5 Common Quail calling in the grasslands! Cloud Cisticola also in full song. Visit the news Archive for birding news and trip reports.